We have a farm and ranch operation. We have cattle, horses, hay and are starting an herb farm. Cattle are worked several times of the year. Horses are worked all year long. The haying operation lasts all summer. The herb farm is a lot of hand labor. 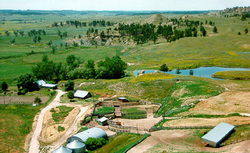 We have elk, deer, antelope and all kinds of birds on our ranch. We are 8 miles from Fort Peck Lake and Missouri River breaks. Directions: IOU Ranch is located 19 miles northwest of Sand Springs. Turn at Sand Springs and go west to Y in road. Take right fork and go 8 miles, then turn right at One Room Country School. Go 2 miles north, and ranch is located along road on the creek.